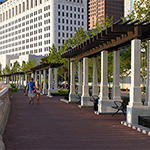 We represented a public/private partnership on an exciting 145-acre riverfront redevelopment project that serves as the crown jewel in the revitalization of Downtown Columbus. This challenging demolition project in the heart of downtown Columbus yielded a jewel of a park in an important urban setting. The high visibility project was concluded timely and on budget, with no legal disputes, and will hopefully encourage further revitalization of the city core. Taxpayers generously funded a cutting-edge 400,000 square foot joint vocational school - larger than any in the state and perhaps even the country. Employing creative contracting techniques, including Quick Pay, allowed the school to open an entire school year early, on budget and with no construction claims or disputes. The challenge was to complete a $200 million renovation of this legendary stadium between several football seasons where delay was not an option. Even when faced with a secondary labor boycott, prompt legal action allowed the project to complete on time, so that Buckeye fans could witness a national championship season in 2002. This was the largest highway contract ever issued in Ohio - to connect I-75 to downtown Hamilton. The project was completed under budget and open to the public 18 months early with no disputes. The project was named “federal highway of the year” and yielded a substantial early completion incentive bonus for the contractor.